Page McKenney #1 with Horacio Karamanos riding won the $100,000 Roanoke Stakes at Parx Racing in Bensalem, Pennsylvania on September 2, 2017. The 17th edition of Pennsylvania's Day at the Races featured five stakes for state-breds with purses totaling $500,000, and despite a bit of wet weather, local Parx Racing fans enjoyed a day full of terrific performances and some dramatic finishes. Millionaire Page McKenney stole the day with a sensational late run to win the Roanoke Stakes while The Man, yes, The Man won for the seventh consecutive time, defeating multiple graded winner Favorite Tale in the Banjo Picker. The race of the day was most certainly the $100,000 Roanoke Stakes. Page McKenney, a winner of 18 career races and better than $1.5 million in earnings was a heavy 3-5 favorite in the field of six. Breaking from the inside gate under regular rider Horacio Karamanos, he had good inside position into the first turn, sitting behind Grasshoppin who had made the lead with little trouble. With no other pace in the race, Grasshoppin was able to lope along on an easy lead, running a quarter in 24.69 and a half in 50.17. Sensing the slow pace, jockey Edgar Prado got Spring Quality in gear with an aggressive early move, charging from fifth to challenge the leader moving to the half mile pole. Meanwhile, Page McKenney was content to bide his time down inside, but as the race progressed, at some point, would need to find a way out from in behind the leaders. Because of the slow pace, the leaders still had plenty left nearing the top of the stretch and the only option for Karamanos was to swing three wide and get clear running in the middle of the track. Having tracked close behind, he suddenly found himself three lengths behind as they all straightened away. Despite having so much working against him, Page McKenney nonetheless showed the grit and determination that have marked his career. He simply refused to lose, grinding away with a late run, wearing down the leaders late, taking the lead nearing the wire and winning by a hard fought neck. Jointly owned by Adam Staple & Jalin Stable, the 7 year-old gelded son of Eavesdropper and trained by Mary Eppler returned $3.20 to win and finished the one mile and one-sixteenth in 1:45.62. The $100,000 Banjo Picker Sprint turned into a stirring match race between The Man and Favorite Tale. The Man was looking for his seventh win in a row while Favorite Tale, a multiple graded winner and third in the 2015 G1 Breeders Cup Sprint was making his first start in almost a year and a half. From his outside post, Favorite Tale won the break and was almost immediately in front. Down on the inside fence, winning jockey Jorge Vargas, Jr. then made what might have been the winning decision in the opening furlong, getting The Man to the outside of Favorite Tale. The two raced as a team for the last half mile, Favorite Tale holding a slight lead after a quarter in 22.50 and a half in 44.69. Slowly edging closer throughout, as they reached the quarter pole, The Man had finally drawn even and coming off the turn, put his head in front. Favorite Tale was game to the finish, but The Man proved to be just a little better, a full neck in front as they hit the wire. Owned jointly by Natalie Baffert & Bernard Sciappa and trained by John Servis, The Man went off as the 2-5 favorite and paid $2.80 to win. The final time for the six furlongs was 1:09.47. The $100,000 Mrs. Penny Stakes, a one mile and one-sixteenth turf test for fillies and mares three and up, was switched to the main track after steady rain moved in. Steven & Jane Long's Great Soul, the heavy favorite at 3-5, sat a perfect pace stalking trip and then off a late bid by Imply to win by a short neck. Winning jockey Brian Pedroza was content to let 10-1 shot Disco Rose make the lead around the first turn, allowing Great Soul to then move off the inside and sit just off the leader on the outside for most of the trip. Never far behind after fractions of 23.3 and 48.0, Pedroza made his move just outside the quarter pole. Seizing command, Great Soul opened a three length lead with only an eighth of a mile to go, but that lead was tenuous at best. Imply, a strong late runner, had saved ground throughout and began to kick in with her run midway around the final turn. She made a strong run in the middle of the track, was gaining on the leader down the lane, but just could not get by the winner. Great Soul, a 4 year-old Great Notion filly, held on. Trained by Tom Proctor, she paid $3.40 to win and finished out in 1:46. 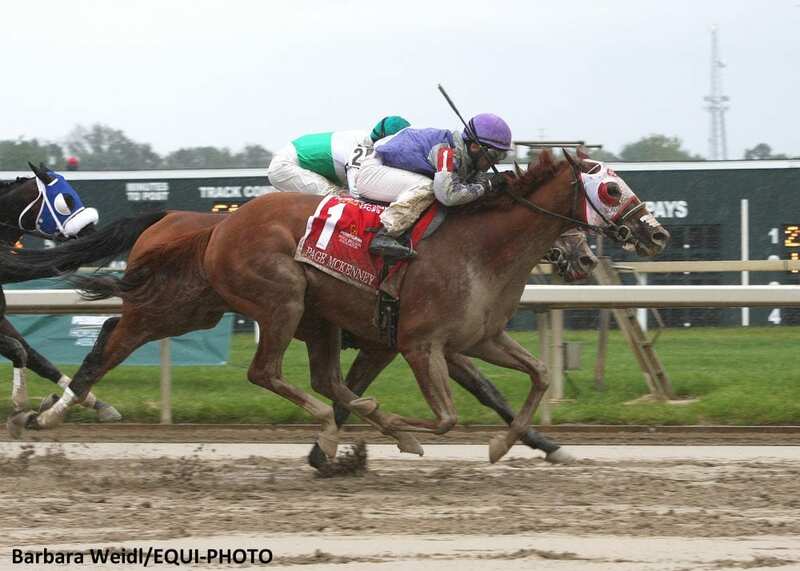 Rained also forced the Marshall Jenney Stakes onto the main track, becoming a five furlong sprint for $100,000. It produced the biggest upset of the day as R & L Racing's Winning the Medal rallied from last at the half mile pole to win at odds of 15-1. It was the second straight year he has won the Jenney, winning the 2016 edition on the grass at a price of 6-1. With Emmanuel Esquivel aboard, the 6 year-old gelded son of Medallist was a bit slow to get going, dropping to the rear of the field in the early stages and amazingly was still about seven lengths behind with a quarter mile to go. Gathering momentum nearing the head of the stretch, Winning the Medal began to gain quickly on the leaders approaching the final furlong. Finding a clear path near the rail, he angled in, came flying up the inside, roared past everyone and won the race going away, a final margin a comfortable two and a half lengths at the end. Trained by Pat Farro, he paid $32.00 to win and finished out in :58.32. This entry was posted in Bloodstock and tagged banjo picker stakes, horacio karamanos, mary eppler, page mckenney, parx, Parx Racing, Pennsylvania breeding, pennsylvania's day at the races, roanoke stakes, the man by Press Release. Bookmark the permalink.